The stage has been set for the greatest duel that will see top drivers battle for top honours against as the KCB Eldoret rally action gets underway in the Great Rift Valley. 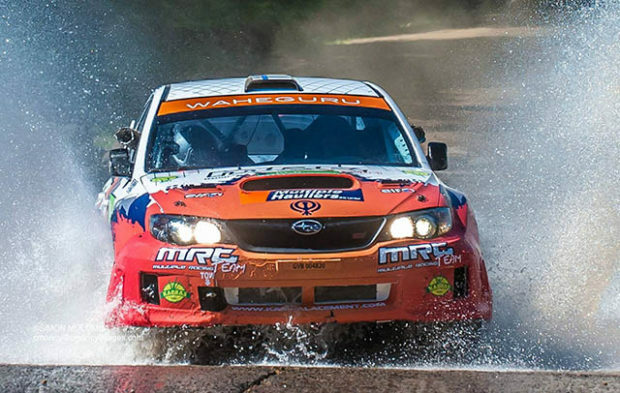 The host town will field in two drivers Umar Khalid and Miten Lodhia with George Mwangi navigating Osman Abdulahi in the Great Rift action. Farhaz Khan who will be powering a Mitsubishi Evo 9 in Eldoret is optimistic that he will put up a brave fight in the outing. The Rally will be flagged off outside KCB Eldoret Branch on Saturday morning, before the drivers head to Elgeyo Marakwet County for the final stages in Moiben and for the prize giving in Iten. According to KMSF Media Liaison Mr Sam Ateka, it’s all systems go for the rally. “The response has been amazing for this particular outing, Eldoret has always determined who wins the KNRC and this perfect opportunity is wide open for both Tapio and Jaspreet “, said Ateka. The epic race will be characterized by undulating hilly terrain with wet surfaces with a combination of speed, skill and vehicle performance determining who will take the bragging rights in the fabulous event. The KCB Eldoret rally scrutineering will take place on 7th October at the at the Sikh Union club in Eldoret town with the reconnaissance taking place along Eldoret Iten road. Elgeyo Marakwet and Uasin Gishu governors H.E Alex Tolgos and H.E Jackson Mandago are expected at the flag off ceremony.